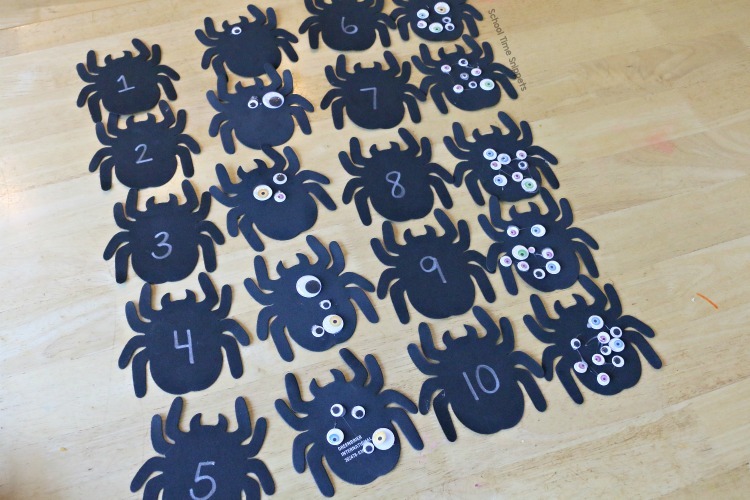 Practice counting numbers 1-10 with this fun spider activity turned number matching game! This hands-on math game is great for toddlers, preschoolers, and Kindergarten-aged kids. Kids will love matching the written numeral to googly eyes! 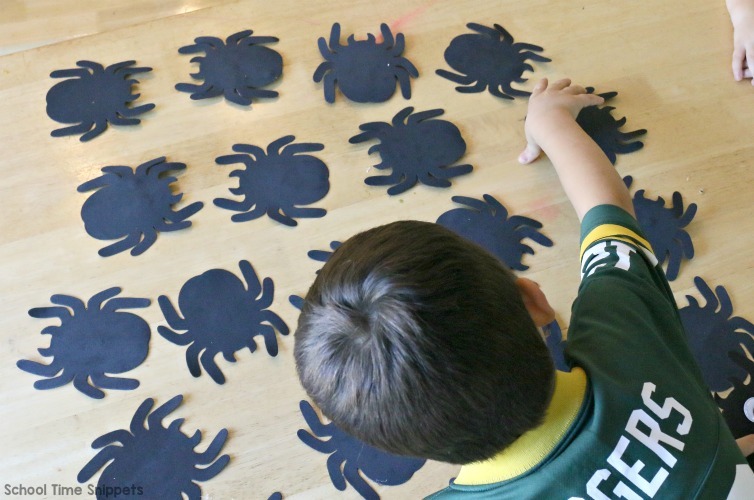 Try this playful spider activity to practice counting, 1:1 correspondence, number recognition, and more! 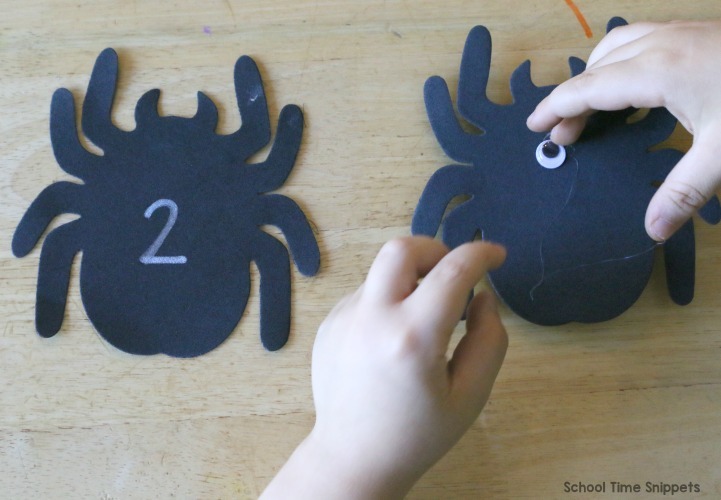 This not-so-scary spider activity is great for little ones to build number sense! 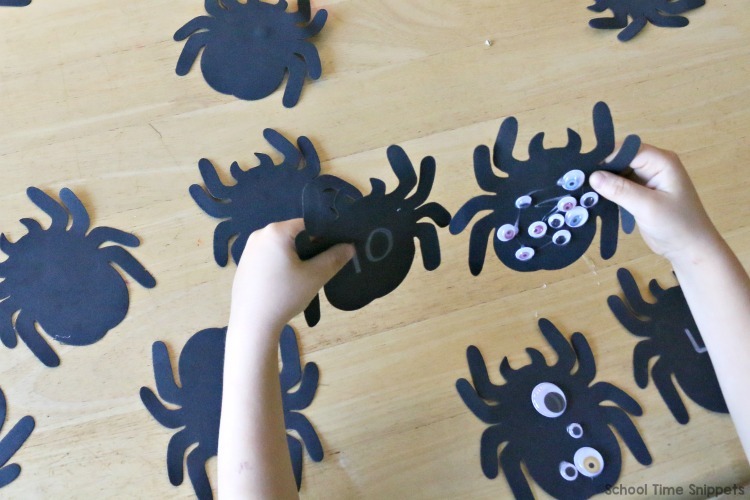 Bigger kids will also enjoy getting to help make this spider activity by gluing the eyes onto each spider. 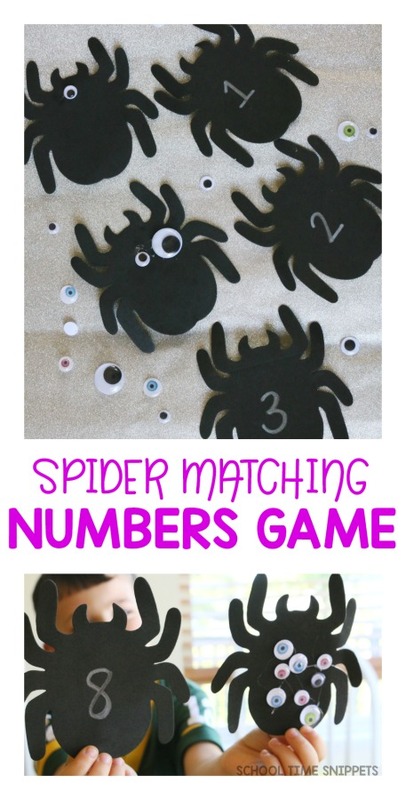 Once prepped, this spider activity turns into a fun number matching game! Purchase enough foam spiders so you have a total of 20 spiders (if working with toddlers, you may only want 10 spiders to work on numbers 1-5). 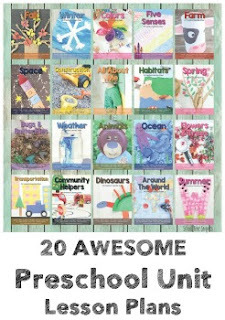 Twenty spiders will allow you to set up a numbers matching game to work on numbers 1-10. On a set of 10 spiders, write a numeral 1-10 with a silver sharpie. On the other set of 10 spiders, count and glue googly eyes to match a numeral. ** We used a hot glue gun, but I would imagine a bottle of glue would work, too. I wanted a glue that was a bit "heavier" and dried quickly. ** Another option is to use adhesive googly eyes to save time! Continue gluing googly eyes to match each numeral 1-10. When completed, you should have a numeral spider and googly eye spider matching pair. There are plenty of ways to use these number spiders. We used this spider activity to play a number matching game. The game is simple! It is played just like memory. Turn each spider over so that the numbers and googly eyes are face down. Mix up the spiders across the playing table. Choose the youngest player to go first by having him/her flip over two spiders. If they find a matching pair-- for example: a number 7 and a spider with 7 googly eyes -- the player gets to keep the match. If not, flip the spiders face down on the table again. Player 2 gets a turn! Continue playing until all the matches have been found. Try this fun hands-on number matching game to work on number sense with your kiddos! This spider activity is sure to be a hit!! Counting googly eyes makes math much more fun!! Spider Number Line-- Have your child put the numeral spiders and/or the googly eyed spiders in order. Spider Seek and Find -- Hide the spiders around the room and have your child find them! 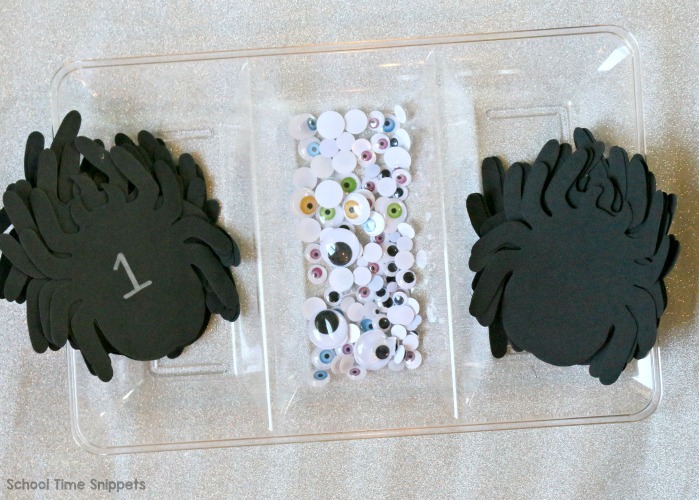 Spider Addition -- Pick two googly eye spiders and have your child add the numbers together. Spider More Than/ Less Than -- Pick two numbers and have your child determine which number is greater/ less than.